The first adult mystery I read was by Agatha Christie, a long time ago. I enjoyed it enough to decide to buy as many as I could, and in the mid 1970s a couple of publishers, including Dell, published a full set of the novels and some short story collections, with nice covers and I bought them as fast as my pocket money allowed. I still have them. About that time I spotted this book and thought I should have it, too, so I’d know what order the books were in, have brief plot outlines to help me remember what I’d read and just as a handy reference work. For some reason lost to current memory, I even bought a second copy, keeping one unread and the other well-thumbed over the years, including a few pencil marks (!) here and there. Yes, though the plot summaries don’t reveal the killer, they do contain clues and spoilers, so be cautious. That hasn’t bothered me at all over the years, as I use this to see where I am in the series and track what I may have read – or not, there are a few I’ve yet to read. While this isn’t a book to read right through, reference books like this rarely are. But this is useful, with all her books in chronological order, with both the British titles and the American titles; her collections of short stories and who was the “starring detective”; a brief biography and a list of full length biographies that were available at the time of the writing of the novel. There are other Christie reference books out there, of various sizes and types, but this one is very handy and I’m glad I have it. I think any Christie reader would agree. This entry was posted in Books & Reading, Friday Forgotten Books, Mystery, Non-fiction, reference. Bookmark the permalink. Richard, in spite of reading and enjoying Christie’s mysteries occasionally, I have never been hooked into her fiction, and I know I’m doing a great disservice to her. I have especially neglected her Miss Marple stories. I started reading the Poirot novels and stories, then moved on to Marple. Now I like them both, though there are a few Marple books I’ve yet to read. I pay the $4.99 a month subscription and hook my laptop up to my TV to watch Acorn TV. I don’t pay for cable/satellite so with my $4.99 a month for that and $7.99 for both Netfllix and HuluPlus, I’m getting off cheaper and am never short for stuff to watch. Carl, I have no idea how one hooks a computer to a TV. I have a LAN, but it only handles the desktop, laptop and iPad. The TV is a separate entity, run through the Comcast cable box and the AV receiver. All it amounts to is buying a cable that you plug into your television in the same way your cable box is plugged in. If you have a laptop with HDMI out and a flatscreen, it is just an HDMI pc cable. If not, you just grab the cable that plugs into the monitor out connection on your laptop. I’m so grateful to the many BBC adaptations of her work, for they pushed me to seek out her actual work…though entirely on audiobook. I have yet to actually “read” an Agatha Christie book. The narrators of her books do such a great job and I’ve found the many I’ve read to be highly entertaining. There is just something so unique to her about how she sets everything up, and the way she phrases things. I have just about all of the Marple and Poirot (and Sherlock Holmes) that were done by BBC, Granada, etc. and like them all. Beautifully filmed. I have only listened to a few of the short stories on audio, as I’m never in the car long enough, and otherwise have a book or the iPad available. We recently watched the final Poirot episode, and the Q&A session with David Suchet after the final episode. It was sad to know that he is retiring but also very satisfying to hear his thoughts on playing this iconic character, particularly with wanting to honor what Agatha Christie created. We watched both on Acorn TV. Worth catching when you can. Carl, we don’t get Acorn TV, but I did catch that Q&A on PBS. I have yet to see the final season of the Poirot. I bought and read this one in 1976, the tail end of my Christie binge that really got started on our belated honeymoon in London in April of 1971, when we bought a couple of Christies almost at random. (I had read AND THEN THERE WERE NONE years earlier.) For the record they were the late, bad Poirot, THE CLOCKS, and THE MOVING FINGER, a Marple from the 1940’s. After that I read whatever I could find and, hence, in no kind of order. I started out reading them at random and still do, though I once decided to read what I hadn’t gotten to in order. I haven’t really read any “bad” Poirot, just some less good than others. I have some other Christe reference books I may put up in the future. I will wade through a lot, but I couldn’t get through THE CLOCKS. Thanks for letting me know I haven’t missed much, Jeff. I’m with Carl. I have most of the BBC adaptations of the Miss Marples and the Poirots. And, I have THE AGATHA CHRISTIE CHRONOLOGY. Now I’m getting urges to read a Christie Right Now! This was a book I wasn’t sure you’d have, George, but I should have known better. I’m just not really a fan of that kind of tale, although Christie was certainly a fine writer. Charles, one of these days I’ll review something you really connect with. I didn’t expect this would be one. I had this back in my teen days when I devoured almost the entire Christie oeuvre over a period of two years. I still have not read four or five of her books. One of them being POSTERN OF FATE which I have no desire to read. Ever. Wynne’s book was very handy for people who didn’t have the Hubin crime fiction bibliography in their local library. Plus all those plot summaries were fun to read, helping me to decide which I wanted to read next. There was also a paperback released around the same time of quizzes and Agatha Christie trivia that my friends and I pored over. As I said in another comment, there are other Christe reference/information/trivia books I have, including the Bedside Book of, that I might review here one day. I really got into Christie once I started (much later than you). 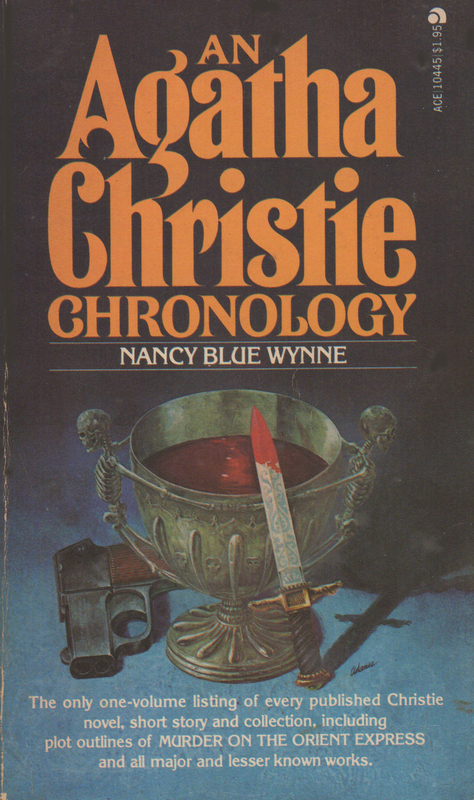 Christie did indeed get a lot of “nice covers” in paperback – kind of surprising actually, since the books would have jumped off the racks with nothing but her name and the titles on the covers. The Tom Adams covers for Fontana & Pocket Books are highly praised, deservedly so, and have been showcased in a book, but I’m a huge fan of William Teason’s still life assemblages for Dell. I pick them up whenever I see them, and there seems to be no end to them. Maybe a collectors’ bibliographic project I’ll tackle some day. Rick, I actually have a couple copies of An Agatha Christie Chronology (but I’m sure that doesn’t surprise you). Like Art Scott I like the Christie covers done by Tom Adams and William Teason. It would be great to see all those Teason covers displayed in a book (hint, hint).